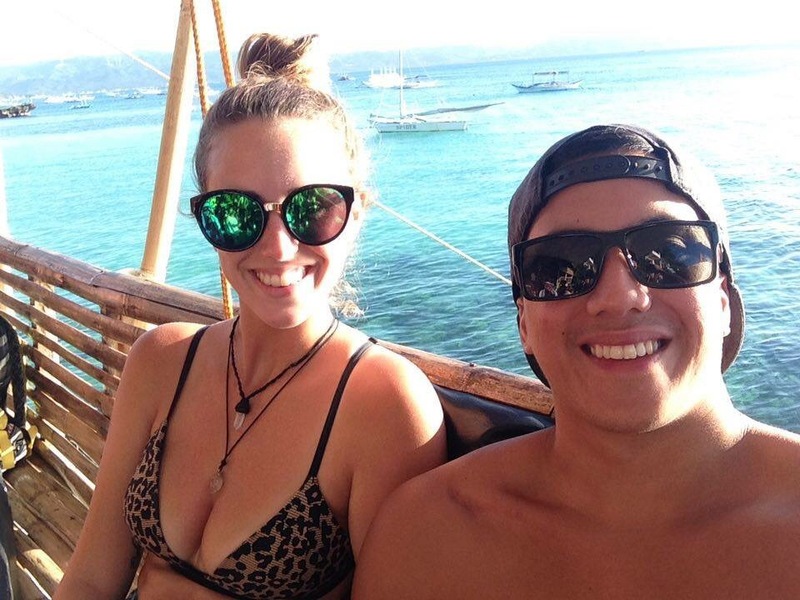 The Philippines had made its way onto my list of places to visit ever since I fell in love with a Filippino, so when Tom’s family started planning a family reunion in the Philippines we jumped at the opportunity. In fact, it was this family reunion that inspired our whole South East Asia trip (best idea ever!). I really didn’t have much knowledge of the Philippines before going. I didn’t even have any idea that it was made up of something like 7,000 islands, did you? When people started asking me if I was worried about going to the Philippines or talking about robberies and kidnappings I felt a little concerned. It’s not like we hadn’t traveled to unsafe places before, but my lack of knowledge of the country made me feel a little unsettled. Well, I can tell you right now that I didn’t feel unsafe at one single point of my three weeks there. It was such an amazing country with so much to offer. You should be adding it to your list of places to visit immediately if you haven’t already. Since we were there primarily for a family reunion, we didn’t get in as much exploring as we usually would if it were just the two of us back packing around like we usually do. This wasn’t a problem though as we had a great time with the family, got to explore with locals to destinations tourists don’t usually go, had advice on all the best local foods to try and now we have an excuse to go back to explore some more. 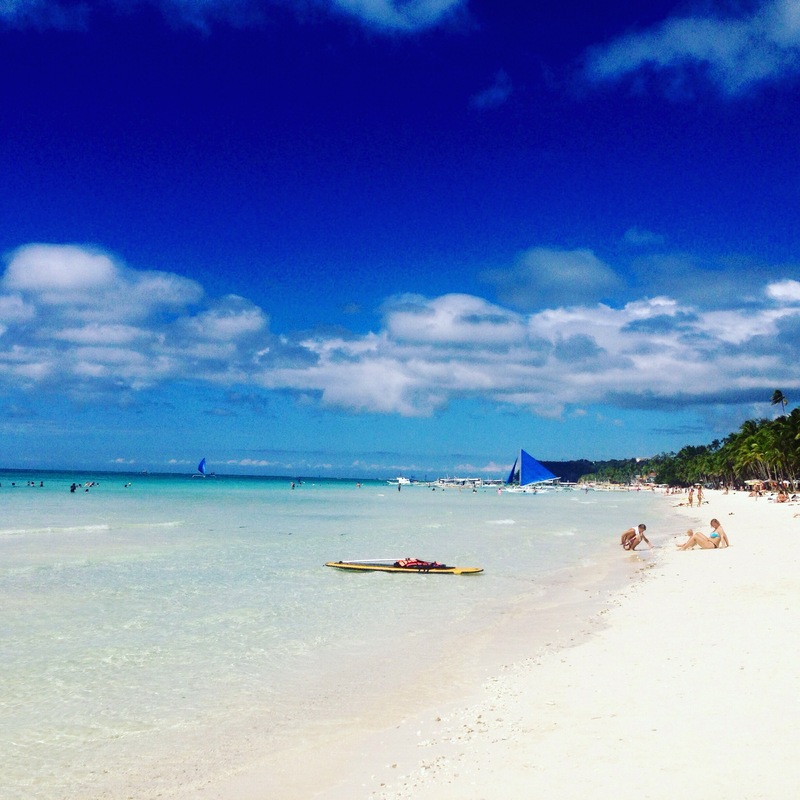 My favourite place we visited was Boracay. 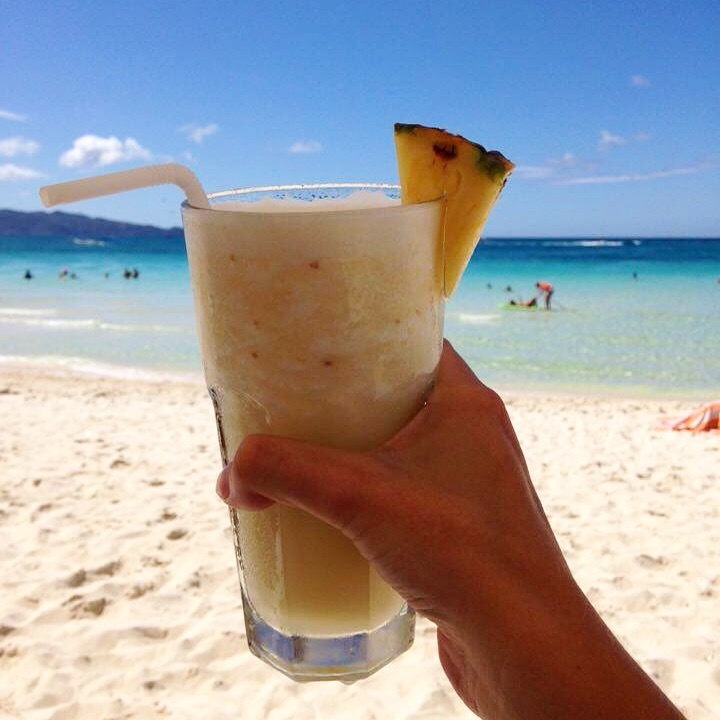 Although Boracay is becoming quite touristy, there are still plenty of untouched areas to explore and the white sandy beaches are enough alone to make you want to visit this picture perfect, tropical island. 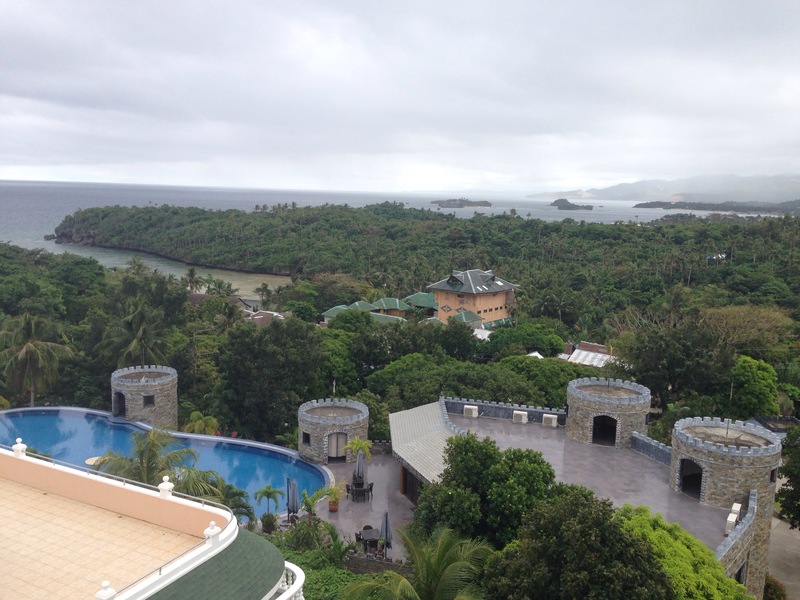 A quick one hour flight from Manila with Philippine Airlines or Cebu Pacific will get to you to Caticlan. From Caticlan you can take a tricycle (a motorbike with a passanger carriage on the side) around the corner to the dock where you catch a 10 minute boat to Boracay. 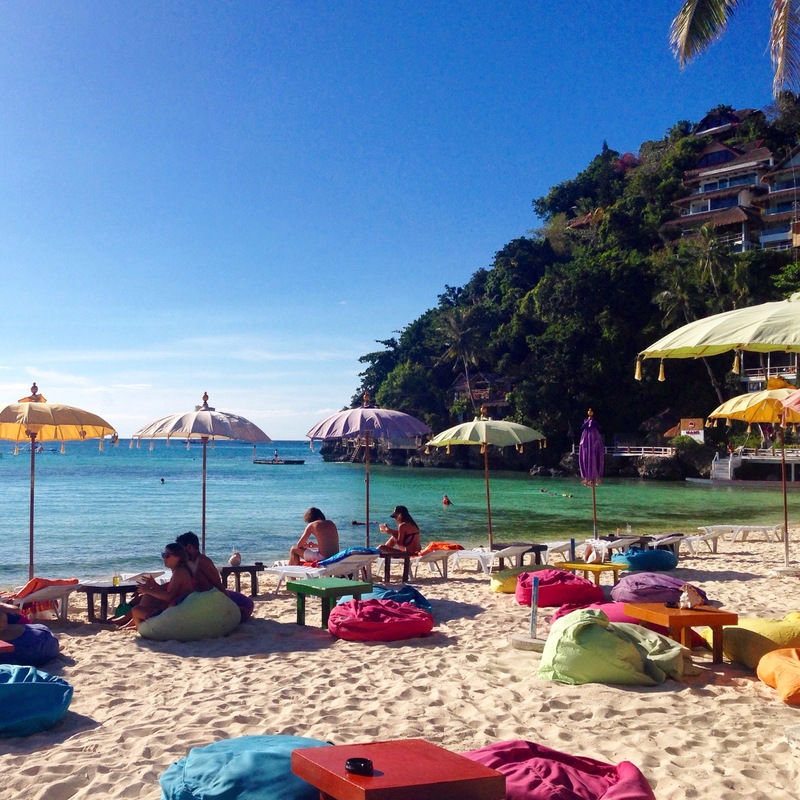 For the four days we spent in Boracay, we hung up our backpacks and lived it up in total luxury. Tom’s mum had completely spoiled us and booked us all into the Penthouse Suite in the Lingganay resort in Station 1. 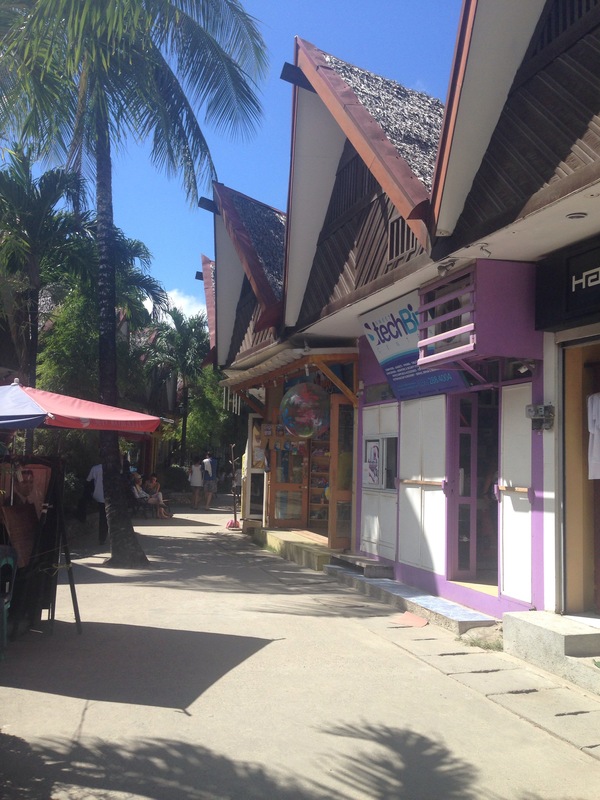 Boracay consists of 3 stations. Station 1 is where you will find all the fancy 5 star resorts, station 2 is middle class accomodation and station 3 is the lowest. This was probably the first and only time we will be staying in a Penthouse so we definitely made the most of it. Our room alone was almost bigger than our whole apartment in Canada. Whenever I picture myself on a tropical island I always envision an infinity pool overlooking the ocean. This isn’t often the case as we are always backpacking on a budget, but this time I would be in luck! The pool was absolutely stunning and even more so was the ocean. The ocean was so clear and bright blue. 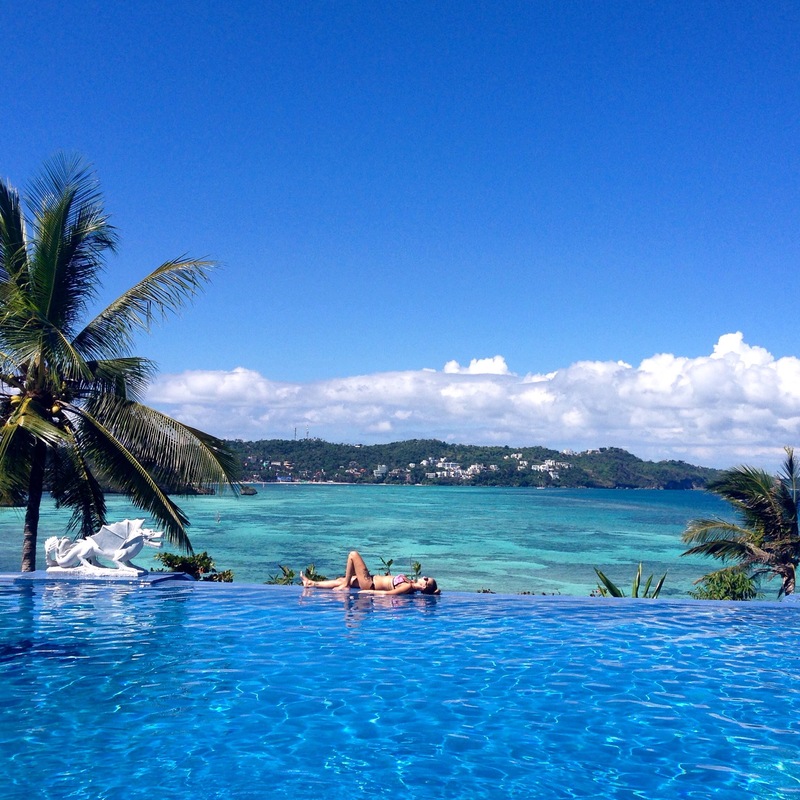 With the pool, the ocean and the sky in one view, it was just a total explosion of beauty and different shades of blue. It’s definitely up there with one of my favourite views of the trip. After spending a whole day relaxing by the pool, we decided to spend the next day exploring some of the islands beaches. 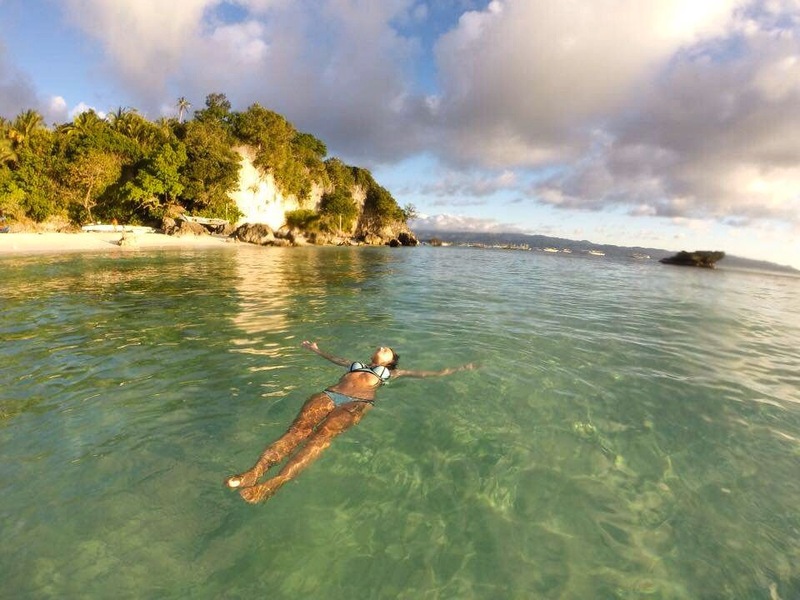 There are plenty of snorkeling, island hopping, banana boating, fish feeding etc tours that you can book with a tour company, but we decided to do some exploring on our own. 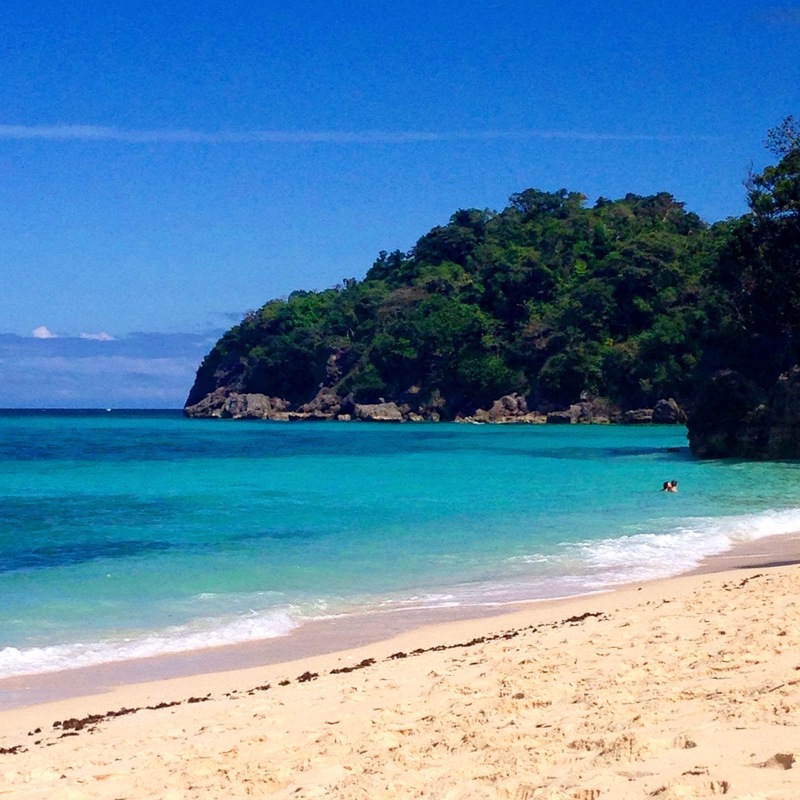 Our first stop was White beach which you will find in station 2. White beach has been voted the most beautiful beach in the world several years in a row and it’s certainly not hard to see why. Unfortunately as with most popular destinations, it has become a little over-run with tourism. There are the usual pushy, but friendly touts trying to sell you things, a sea of chairs an umbrellas lining the sand and a number of jetskis, paddle boarders and banana boaters littering the ocean. 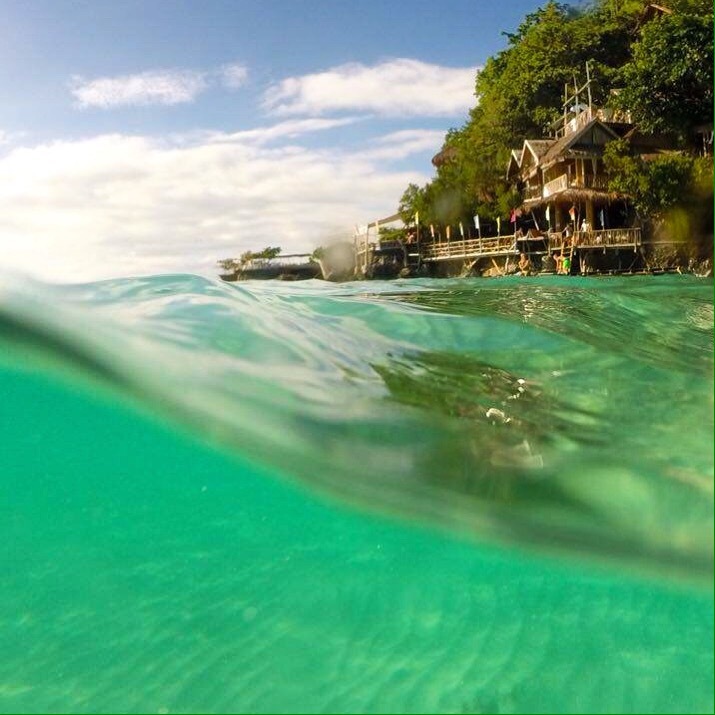 If you can look past all of this, the beach really is a sight to behold. Once we were finished marveling at the powdery white sand and dipping our toes in the warm turquoise ocean, we grabbed another tri cylcle and headed to Puka beach. 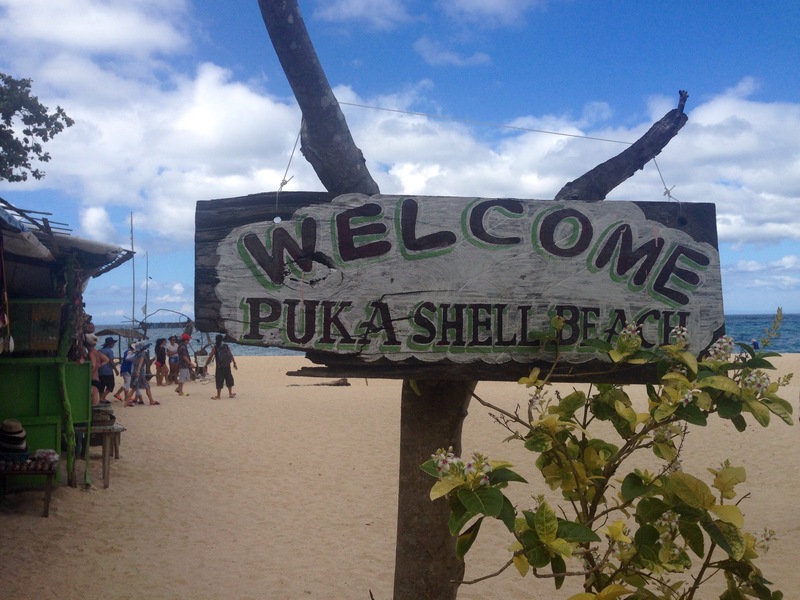 Puka beach is right down the other end of the island as is known for it’s shells. Straight away, I noticed how much quieter this beach was. Next, I noticed the sand was more of a yellow colour and filled with shells, and thirdly I noticed the bright blue of the ocean. It was such a different beach to White beach, it was hard to believe we were still on the same island. It rained a little on and off when we were there but that didn’t stop us enjoying the sun and the water in between rain showers. The water was a lit rougher here, but still enjoyable to swim in. After a good few hours at Puka beach, we grabbed yet another tri cycle and headed for our last destination of the day- Dinniwid beach. As soon as we arrived at Dinniwid beach we all gasped in awe. It was by far the most beautiful beach of the day. Colourful bean bags and umbrellas linned the sands around the beach bar Wahine (a great place for a drink) and the ocean was so calm and by far the clearest water I have ever seen on all my travels. I had found my paradise. Tom’s sister Kristine and I floated around in the warm water until the sun had set and we were well and truly wrinkely from the water. It was the perfect way to watch the sunset. We all loved Dinniwid beach so much that we decided to return the next day. 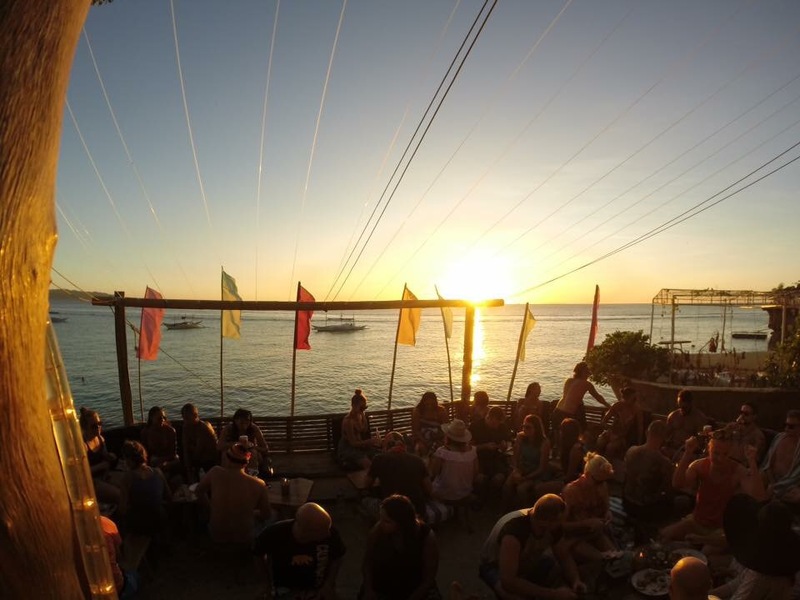 This time we decided to watch the sunset from the bar called Spider bar after a recommendation from Tom’s cousin. 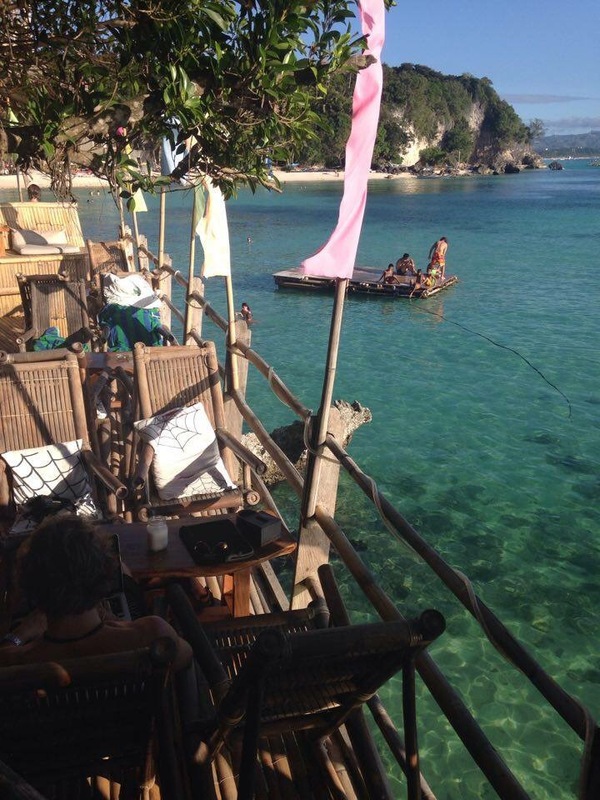 If you are ever in Boracay, do yourselves a favour and go to Spider bar. This is a big call, but it is probably one of the best bars I have ever been to. To get there you can either swim out a little bit and climb up the ladder straight into the bar or you can walk along the path on the cliff and through a cave. Everyone in the bar is in their swim suits, its such a cool and relaxed vibe. You can climb down the ladder and swim or you can sit in one of their many seats and enjoy the fantastic views of the ocean. The food is also outstanding. We tried the pepperoni pizza and the tomato and basil home made pasta (both very un-filippino dishes) and they were to die for! We watched yet another amazing sunset before retiring back to our Penthouse. There are plenty of restaurants in Borcay offering a number of different cuisines. You will find most of these along White beach and in D’mall which isn’t really a Mall at all as the name suggests, but more of an outside pedestrian area lined with shops and restaurants. My favourite place we ate at was Spice bird (again, not filipino food but still delicious all the same). Spice bird is kind of similar to Nandos, but a thousand times better. There’s a few different things on the menu but we had the 1/4 chicken. It comes with rice, salad and a bread roll. The chicken is grilled to perfection and comes with four different sauces to try. My favourite was the Salsa verde and Garlic and lemon mixed together. Four days came to an end all too soon and I was definitely not ready to leave. 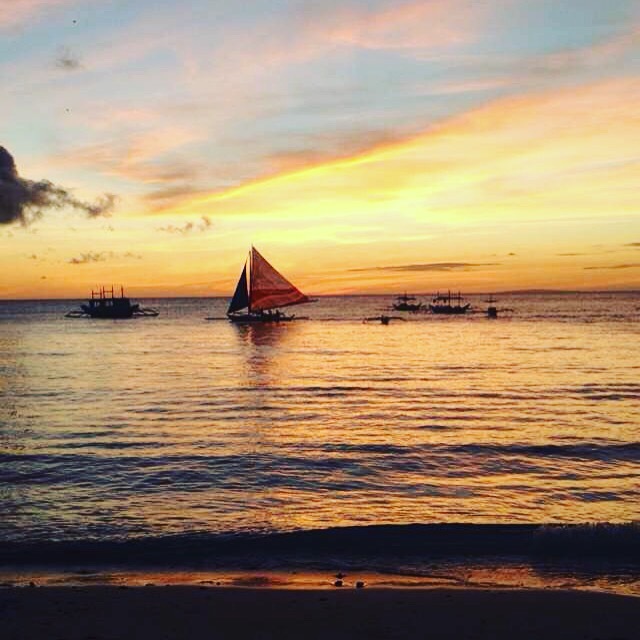 I felt like I needed at least another week to explore and uncover all of Boracay’s beauty. I will definitely be returning here one day soon, hopefully before it becomes too over-run with tourism. 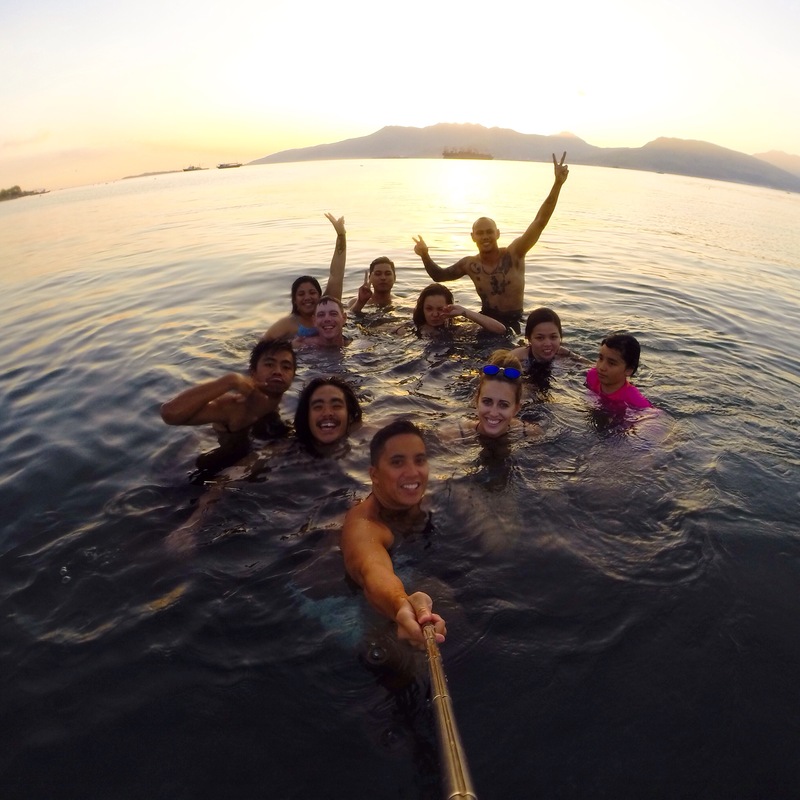 I really loved my three weeks in the Philippines. It has a completely different feel to the rest of South East Asia and reminded me more of the States and Latin America. The food is different and not comparable to other cuisines. It’s rich and heavy (good luck finding vegetables!) but I liked it all the same. The people are so helpful and friendly and the customer service is outstanding no matter where you go. I’m certain there are unsafe areas where you should not venture to, but if you use your common sense, do your research and stay in the right areas you will have nothing but good things to say about the Philippines like I do. I can’t wait to go back one day!